"I've been on every single one that we've had through the years," Bennett after rehearsing a duet with Carrie Underwood. "And what I love about it ... this is the only place where all the performers get together in one weekend, and it's so great to see old friends and new guys that are coming up." 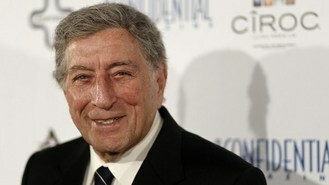 The 85-year-old entertainer said he knows most of the artists, "and the new ones, I'm interested in". He and Underwood are set to perform the 1924 classic It Had to Be You. Underwood, 28, called Bennett "America's most enduring artist". After running through their Grammy performance three times, Bennett told Underwood: "It was beautiful singing with you." "She's beautiful and she sings great and she's so popular," he said as he came off stage. "It's just a wonderful experience to be on the show." The pair will also present the award for best new artist. Up for the honour are The Band Perry, Bon Iver, J. Cole, Nicki Minaj and Skrillex. Grammy Awards executive producer Ken Ehrlich said it was great seeing Bennett - his long-time friend and a 15-time Grammy winner - on the stage. The producer is proud of all the show's performers, which include Bruno Mars, Chris Brown, Katy Perry and Adele, and he is especially excited about the opening number - Bruce Springsteen's new song We Take Care of Our Own.